Location: Ramp #43, Cape Point, Hatteras Island. How To Find It: Take Ramp #43 onto the beach and turn south. Just 30 ft. or so on the right is a heavy double beam section of wreckage. It is also only a very short walk from the paved parking area next to Ramp #43, so a 4WD is not really necessary to access this site. 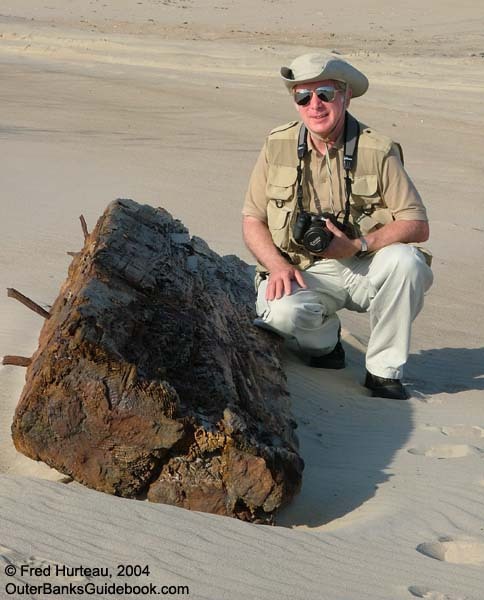 This heavy chunk of wreckage was discovered near Ramp #43 at Cape Point. 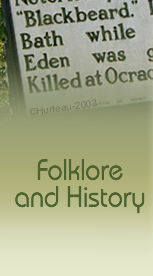 It was found, like many others on these pages, in October, 2004, after an active hurricane season on the Atlantic coast. 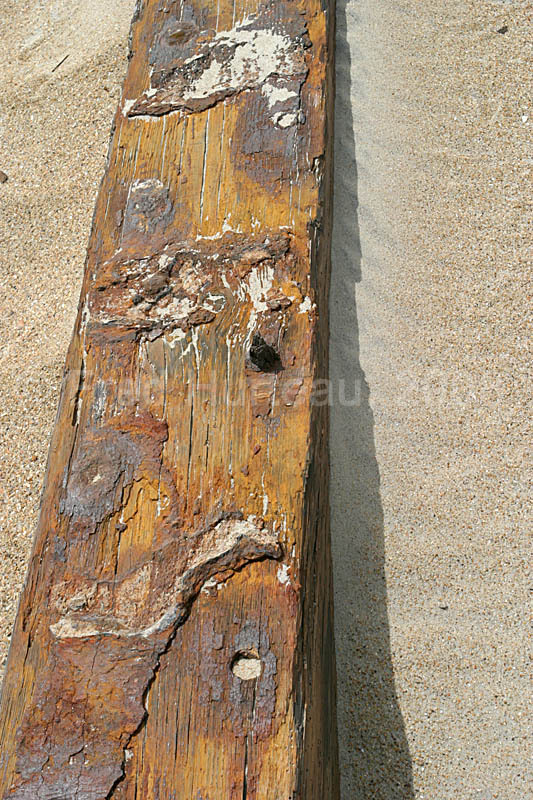 The metal spikes were heavily rusted, indicated it had been exposed to the elements long before it washed up here. The people in the background of the upper left photo are walking down Ramp #43, showing the proximity of the wreckage to the ramp. Cape Hatteras Lighthouse is visible in the far background. 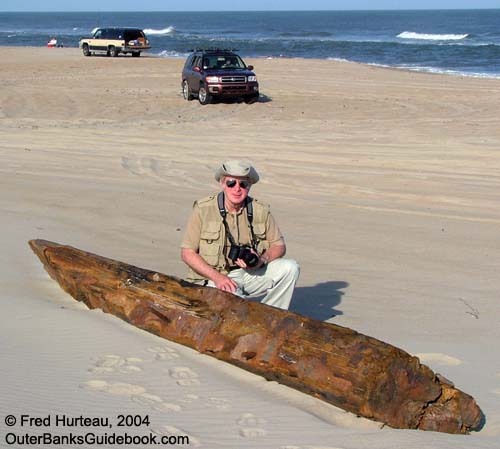 The lady in the photo was kind enough to take these pictures of the author next to the wreckage, providing a scale to judge the size of these heavy beams. The lower left photo shows the wreckage position relative to the ocean. 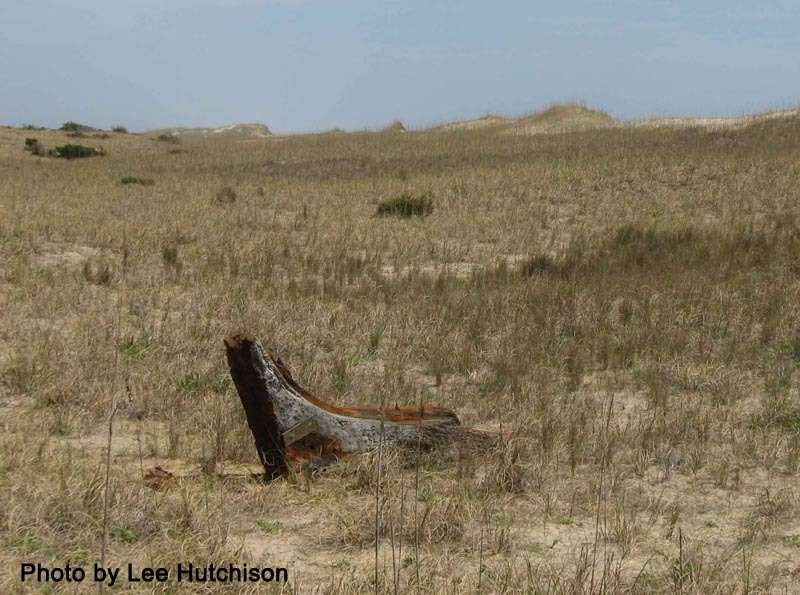 A winter storm could easily move this wreckage from this unprotected position at the cape. 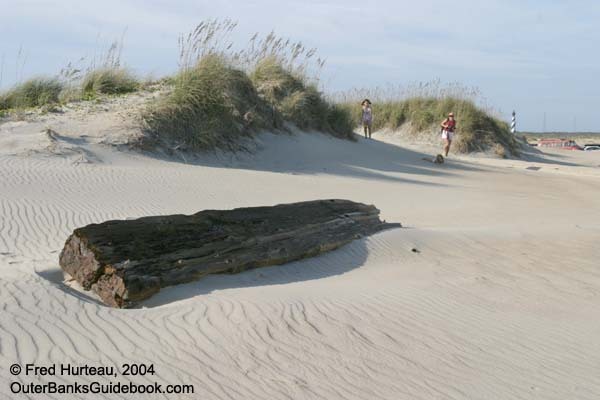 The cape had changed size and shape considerably from the previous visit only 6 months prior, indicating how greatly hurricanes and storms affect the beach and dunes. Update - Ten weeks after the initial October discovery of this site it was checked again. 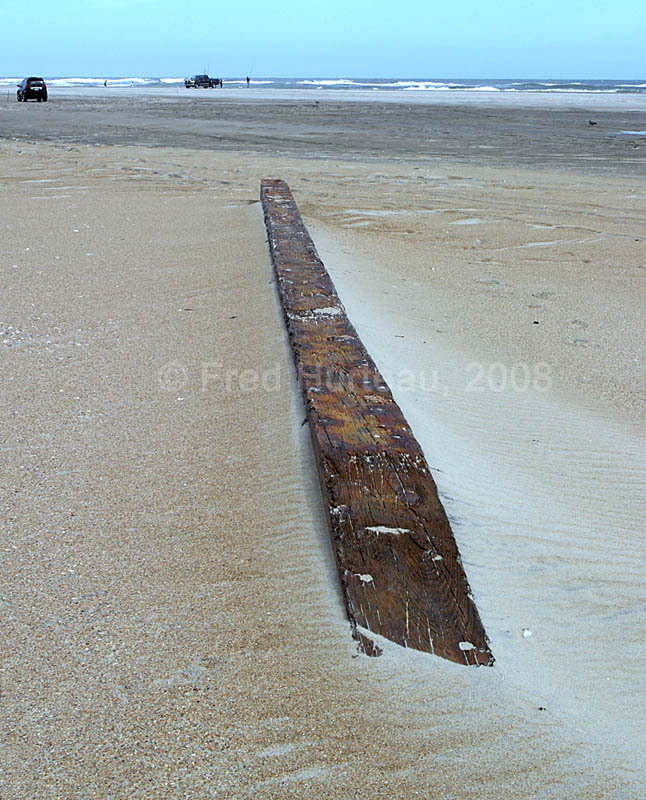 The wreckage was still located in the very same spot, though it was already half buried in blown sand, but still visible. Cape Point south of this site had changed dramatically in those ten weeks, even more so than during the previous 6 months as reported above. Location: One mile north of the beach ramp, north of Corolla at the end of Hwy. 12. How To Find It: From the ramp north of Corolla at the north end of Hwy. 12, go one mile north on the beach. 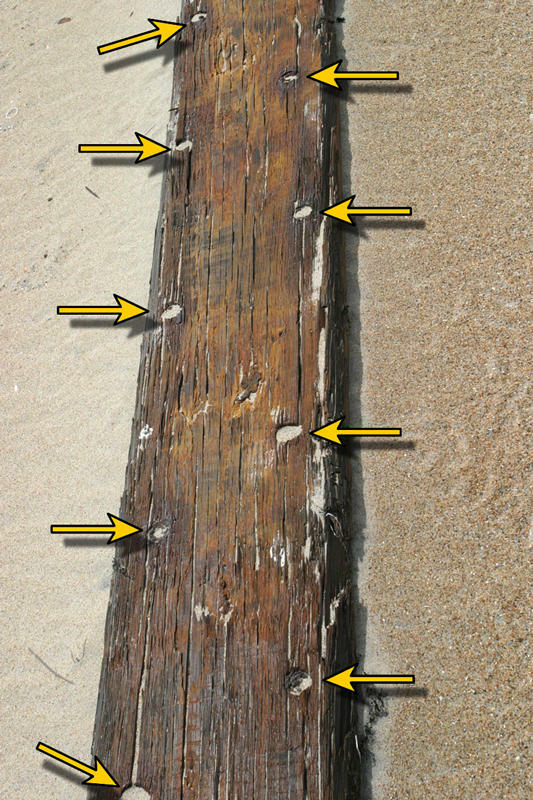 If visible, ribs are protruding from the beach during low tide. 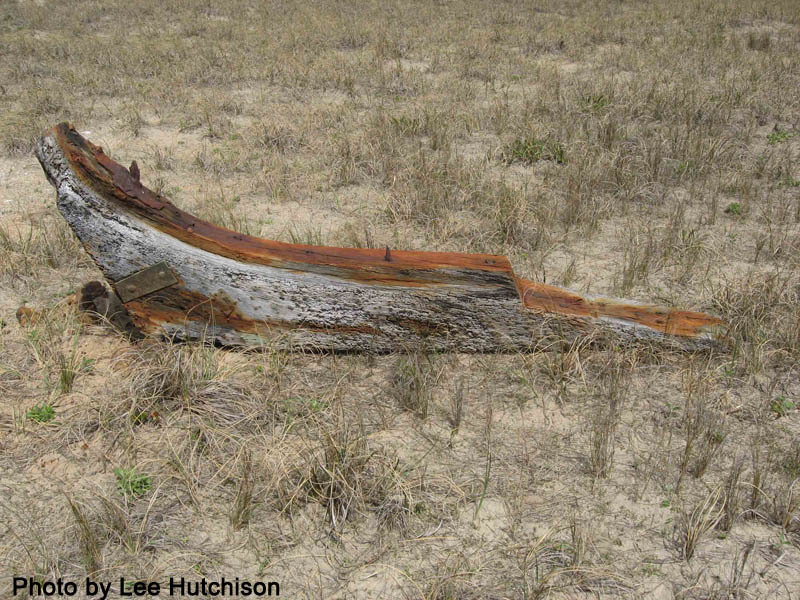 May initially be mistaken for more tree stumps until you get close and see the squarish beams in a tight row. On the way north to take more photos of wild horses at Carova, the author stopped in Corolla at "Winks of Corolla", a small mini-mart/gas station just north of the lighthouse. Inside he noticed a postcard picturing a wreck he had not heard about and asked the clerk about it. She said the wreck was sometimes visible and was not far from the beach ramp. So on the way north to Carova a careful eye was kept for anything resembling this wreck. Among the jumble of tree stumps that populate this area of the beach there was a row of what looked like small tree stumps higher on the beach than the others. 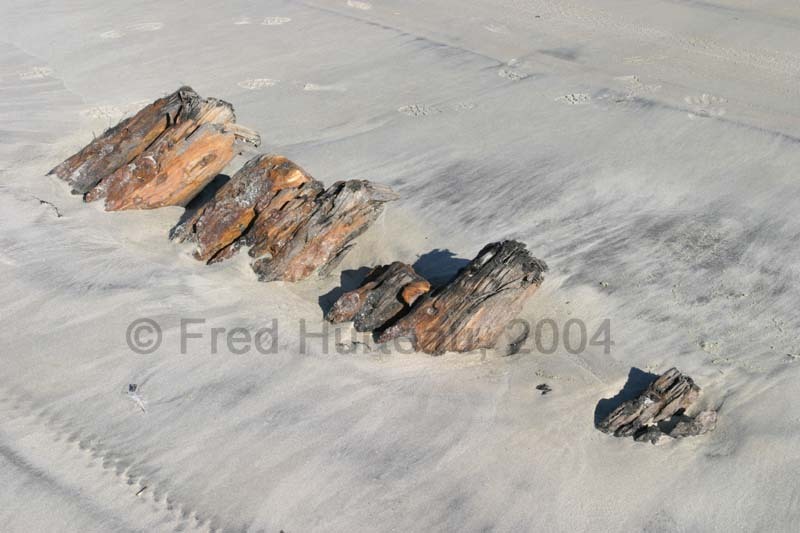 These turned out to be the ribs of the wreck seen on the postcard. Looking at the photos you can see how closely vehicles pass by this wreck, and in fact, drive right over top of it, not knowing what is under the sand. Location: 100 ft. north of the beach walkover steps at the Asheville Drive Public Beach Access, near mm7.5 on Hwy. 12 beach road in Kill Devil Hills. How To Find It: In Kill Devil Hills, on US 158 go to the stop light at the entrance to the Wright Brother's Memorial site and turn east onto Prospect. This takes you to the "beach road" (old NC 12). Turn north on NC 12 and you will quickly come to the Asheville Drive Public Beach Access parking lot on the east side of the road ( this access is 500 ft. south of mm7.5 ). Park and walk over the boardwalk onto the beach. 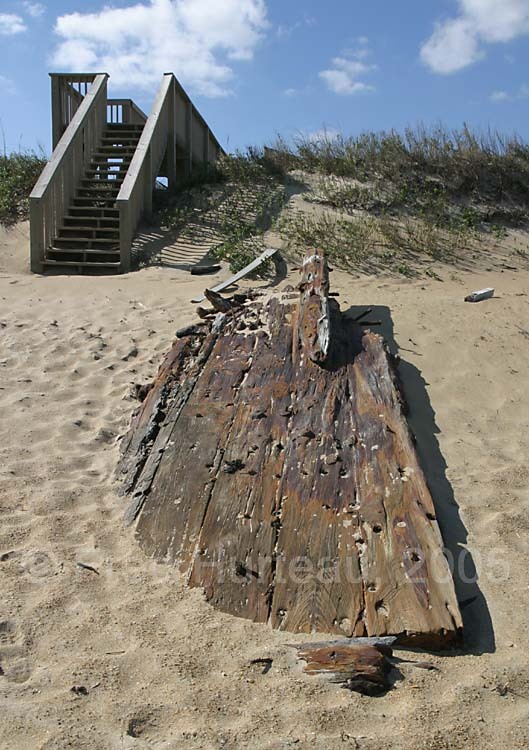 The wreckage is at the base of the dunes beside the next set of wooden steps, 100 ft. north of the beach access steps, as shown in the photo below. This large chunk of wreckage was discovered quite by accident while on a quick early morning visit to the closest beach access hoping for a nice sunrise photo. There was a fierce 30-40 mph wind whipping along the beach from the north, so facing southeast toward the expected sunrise and away from the wind was much warmer. It was soon obvious the sunrise photo was not going to happen due to the thick clouds on the horizon. A fleeting glance to the north into the biting wind as the author turned to leave revealed this wreckage a mear 100 feet up the beach. These photos were taken later in the day after the clouds blew away and the sun came out, and the wind had calmed to a mear 20 mph or so. It's size can be gauged by comparing it to the steps in the above photo. Update: December 2009 - After two strong nor'easters of late November and mid December of 2009 this wreckage was not visible. It was either covered with sand, or more likely moved by the ocean's fickle whim. Location: just south of the Glenmere Avenue Public Beach Access on Hwy. 12 beach road in Kill Devil Hills. How To Find It: In Kill Devil Hills, on US 158 go to the stop light at the entrance to the Wright Brother's Memorial site and turn east onto Prospect. This takes you to the "beach road" (old NC 12). Turn south on NC 12 and immediately on the left is Glenmere Avenue Public Beach Access parking lot on the east side of the road ( this access is 500 ft. south of mm7.5 ). Park and walk over the boardwalk onto the beach. 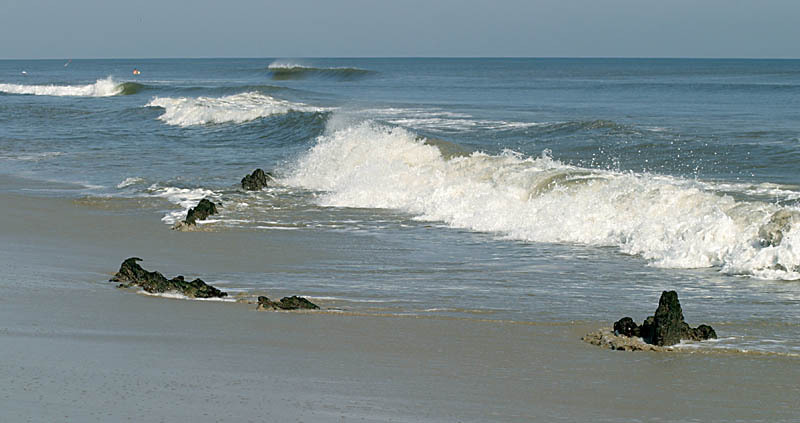 Turn right and walk south on the beach to look for the wreckage along the surf line. 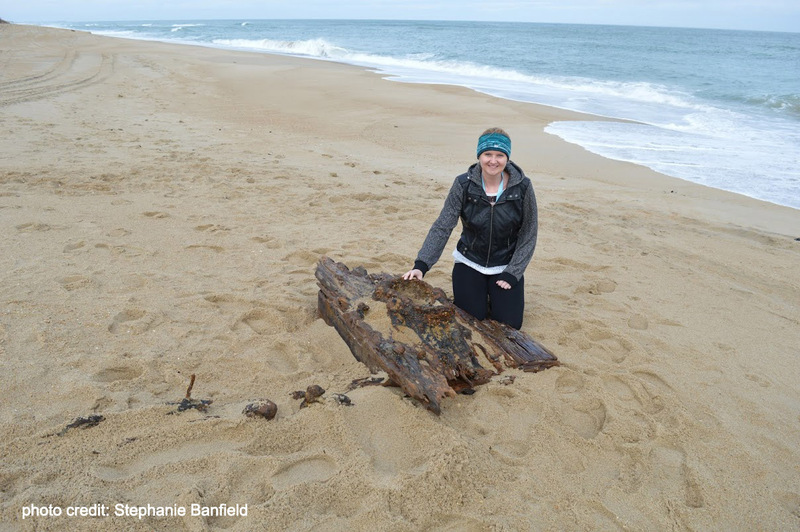 This chunk of wreckage was discovered and reported by Stephanie Banfield on Feb. 15, 2016. 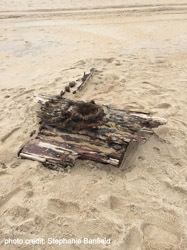 Stephanie's short report stated, " I found it today just south of the Glenmere beach access in Kill Devil Hills, right in the surf line". These photos, supplied by Stephanie show her next to the wreckage, and some other views. Note: This wreck isn't going anywhere anytime soon. It is so far under the sand it would take a major storm to uncover and move it. However, the visible tips will easily be covered and uncovered as the sand builds and washes in this location. It would only take a foot of sand to make it disappear from view. How To Find It: In Kill Devil Hills, on US 158 go to the stop light at the entrance to the Wright Brother's Memorial site and turn east onto Prospect. This takes you to the "beach road" (old NC 12). Turn north on NC 12 and you will quickly come to the Asheville Drive Public Beach Access parking lot on the east side of the road ( this access is 500 ft. south of mm7.5 ). Park and walk over the boardwalk onto the beach. Go north up the beach. 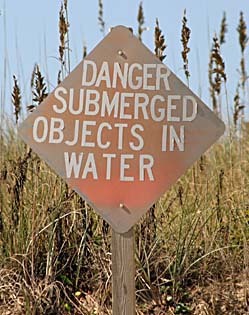 It is marked by signs at the dune line, posted near either end of the wreckage, which say "Danger Submerged Objects In Water". (Note: Dec. 2009- these signs had been washed away along with part of the dunes.) The wreckage is about 5 or 6 buildings north of the beach access steps. It can only be seen at lowest tide, and probably only when the ocean is fairly calm, and there is no wind from the NE or East to keep the low tide from receding fully. This a very long wreckage. The part that was visible on the day these photos were taken stretched along the beach for 40 paces of the author, which calculates to about 110 feet. I actually found this in the dark, about 10 pm, walking on the beach under a 3/4 moon. I didn't even have a flashlight. I returned to my room to get my camera and a light, but I only had a tiny 2xAA battery penlight, which was barely enough to allow the camera's autofocus to work if I fiddled with it long enough. I got a couple of usable shots with the flash that night just to verify what I was seeing was a wreck, because I could not tell for sure by the flashlight. I wanted some verification in case I could not find it the next day. The next day at low tide I went back out and found it easily. 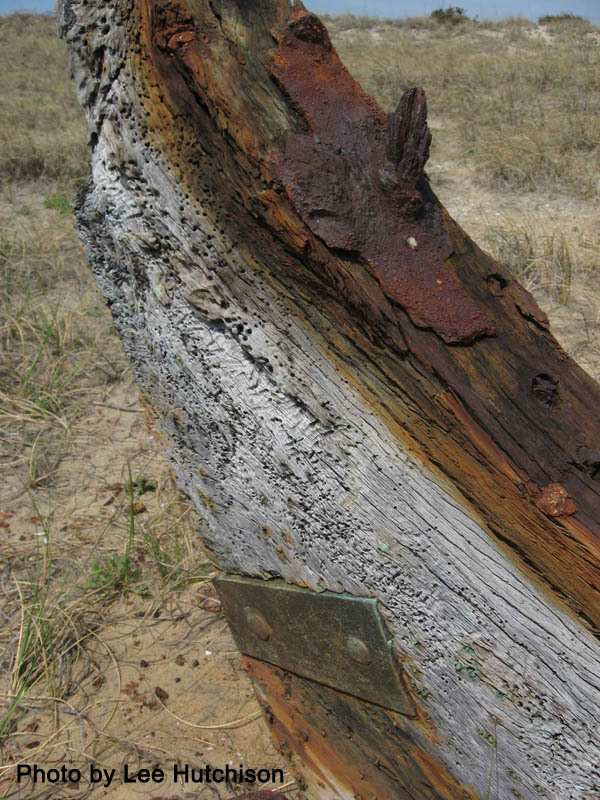 That's when I discovered the warning signs posted at the dune line, aligned near each end of the wreck (shown at right). This gives some idea of the size of this wreckage. 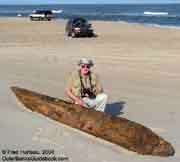 What you see in this shot is only about one-third of the length, as compared to the beachgoer standing next to it. third of the wreckage. This shows most of the length from more of a side angle, still looking northward. 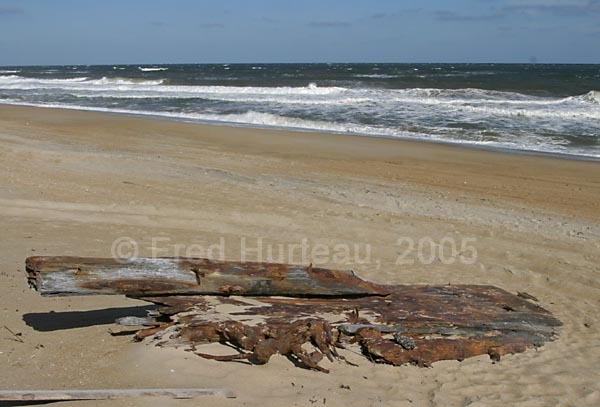 Location: southmost sand spit, Cape Point, Hatteras (at Buxton). 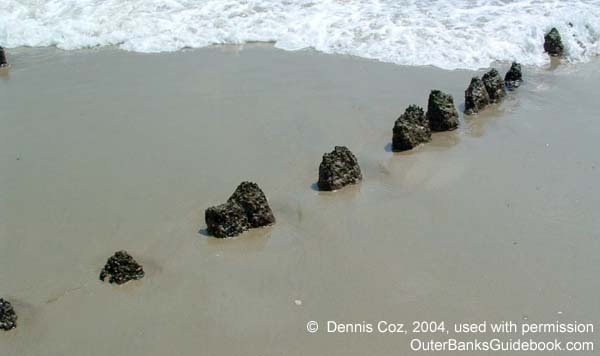 How To Find It: From ramp 43 or 44 at Cape Point, Hatteras, go south along the beach until you reach the point. This long beam was in the middle of the widest area just north of the point's tip. The left and right photos show either end of the very large and long beam sitting in the open at Cape Point. This piece has obviously either been uncovered or washed up recently, as it has not been seen before during any of the many repeated trips to this same spot in the past five years. It appeared in good condition, and was similar in appearance to the wreckage at the top of this page identified as ID: UNK-9_10-19-04. It may very well be from the same wreck. 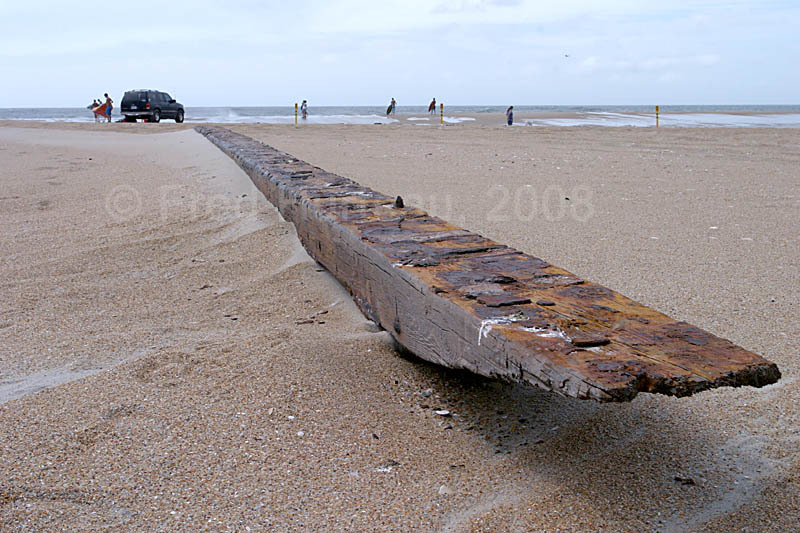 This beam was a good foot across in width, and as you can see by the photo below of the beam shown next to the truck, it was nearly three times as long as the full-sized crew cab truck. The truck measures 19 feet, and the beam seems to be about 56 feet long. Both ends of the beam were cut at the same angle as if to be lap-joined with another section. If so, it had to be from a pretty large ship. The two close-ups above show details of the beam. 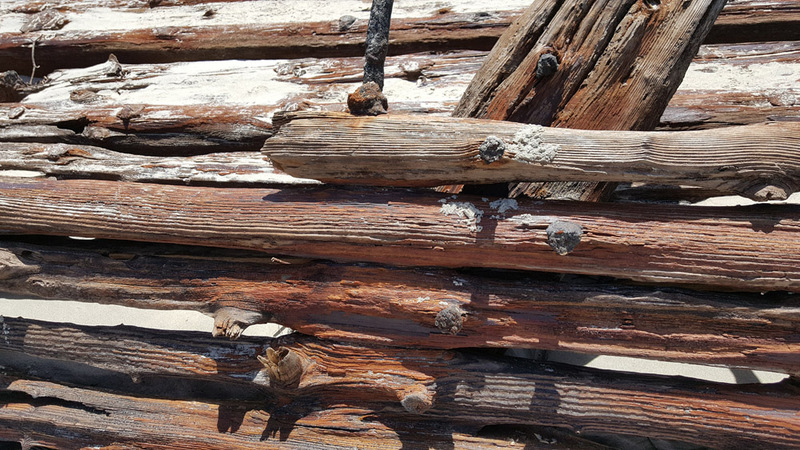 The left photo with the arrows shows the evenly spaced, alternating holes in the beam where wooden dowels or iron bars were used to join the beam to its neighbor. The right photo shows the rusty-looking layer of filler that sealed between the beams. In the same shot there is one dark spot, which is a broken dowel still in its hole. 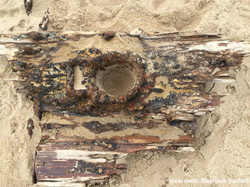 These are clues which help identify wreckage from other wooden flotsam that often washes up on the beach after storms. Considering that this wreckage is on Cape Point, it is highly likely that it will be moved or will disappear during the next storm. Cape Point is constantly reshaped by the elements, and looks different on every trip there. Note 1: On each subsequent trip to this location this long beam has been gone as expected. There is little chance it will reappear here. 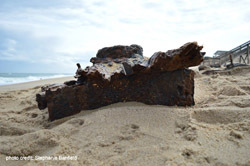 Did you discover a shipwreck site on your Outer Banks vacation? Share Your Sightings and Location Reports. It's easy. Here's how to send your report. 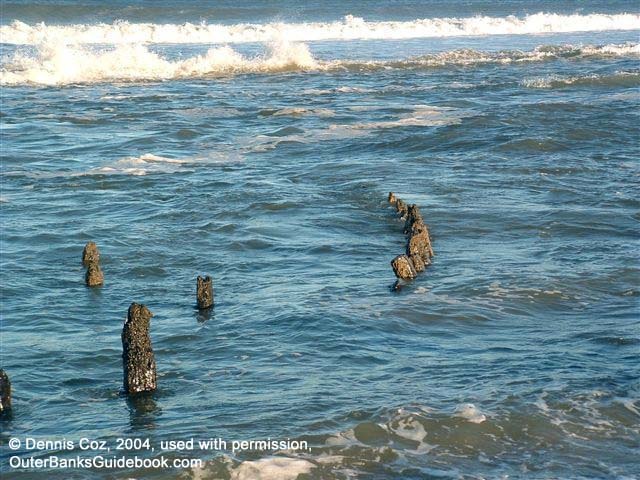 The wrecks in this section have been reported by folks just like you who visited the Outer Banks and discovered wreck sites not previously reported here on CarolinaOuterBanks.com. 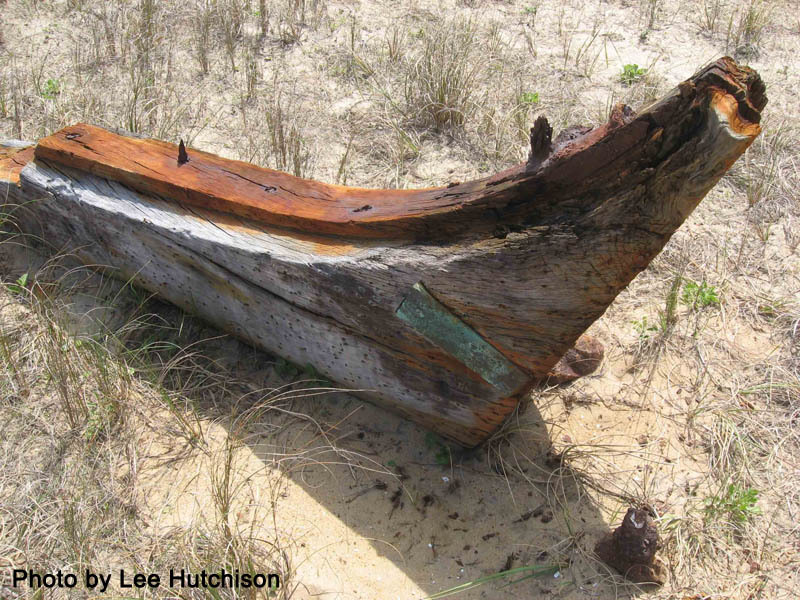 They sent in their photos and wreck reports to share their discoveries with everyone. If you have information or reports to send, or have better, newer photos and information about a wreck site already listed on our site, please send them along. You will be credited for your efforts. 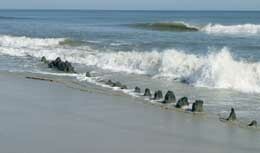 Location: Nags Head, on the beach at the edge of the surf, at approximately the 15 1/2 milepost. Dennis Coz of Ohio sent in this "Sightings and Location Report" with the two great photos at right. 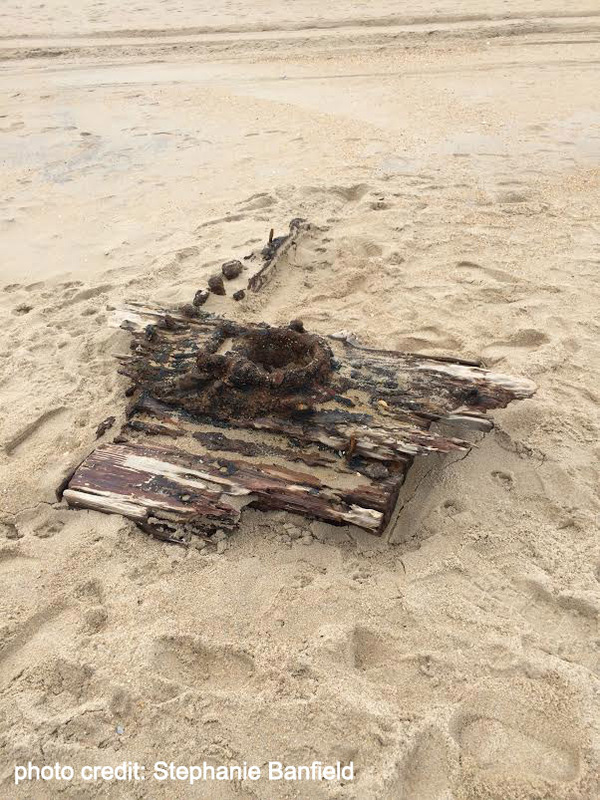 This apparent shipwreck is right in Nags Head. Dennis discovered this site July 12, 2003. 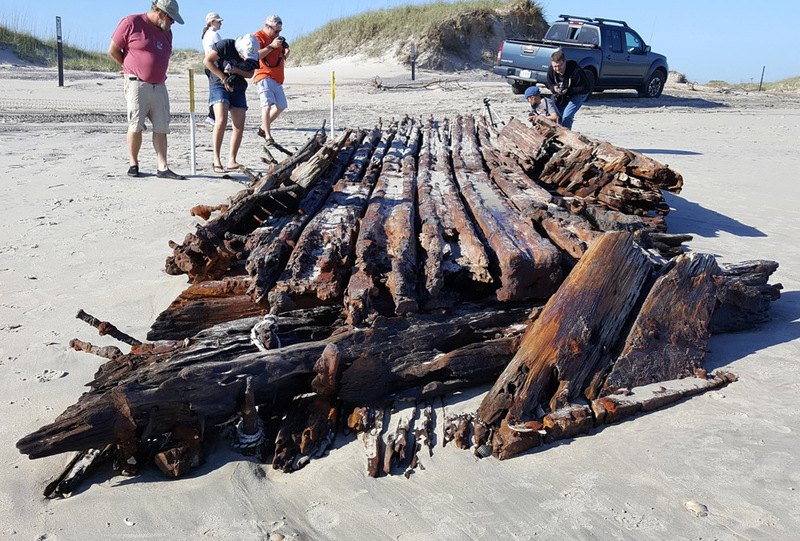 Dennis writes, "Everyone else, including the locals that I talked to seemed oblivious to what was in the water, but it sure looked like a shipwreck to me. One person did say that it just appeared a few weeks before we were there. Obviously it is probably gone again after the storm last year [Hurricane Isabel, Sept. 2003]." Dennis adds, "A little more info on the pictures. 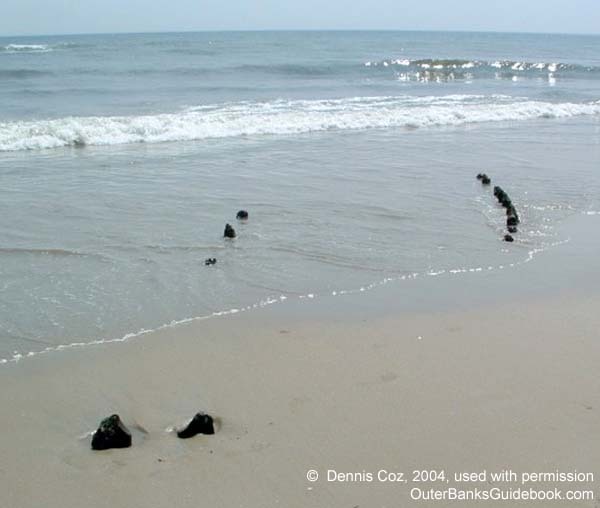 They were taken 7/12/03 at 11:37 AM and 11:39 AM with a Fujifilm Finepix 3800, 3.2 megapixel digital camera..."
Dennis is a frequent visitor to the Outer Banks, and reported earlier that "We were there in May of 2004 and it was not visible." But on the latest visit, it was visible once more. Dennis writes, "We visited the Outer Banks in early December. 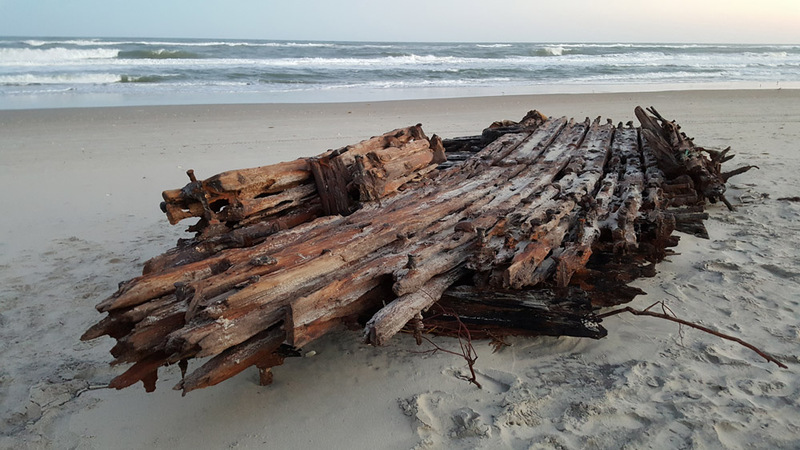 Much to my surprise, the unknown shipwreck on the beach at Nags Head had reappeared. It is still where it originally was sighted in 2003, between MP15 and MP16 on the beach road." ..... "The photographs were taken at about 4:00 PM on December 1, 2004. I believe it was near low tide at the time. I noticed that the water is higher on the beach than in the past, possibly due to erosion from the recent high surf that was reported in late fall. 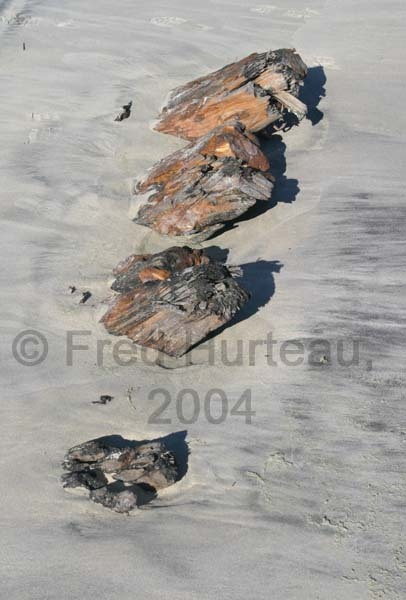 The timbers appear to be more exposed from the sand than in 2003, however since the water is higher on the beach, it is now all within the surf, and not at the edge of the beach as was reported in 2003." Location: Approximately one half mile north of Ramp #30, located in the grassy area 50 feet behind (west of) the beachfront dunes. How To Find It: The location is approximately half way between Salvo and Avon on Hatteras Island. Park in the paved parking area at Ramp #30 and walk north. If 4WD access is permitted at the time of your visit, you could take Ramp #30 over to the beach and drive north 1/2 mile. These excellent photos by Lee Hutchison of Charlotte were sent in with his wreckage report. Mr. Hutchison reported, "I found the wreckage quite by accident. It is about 6 feet in total length and 3 feet in height..."
When these photos were sent to the N.C. Office of State Archaeology, the responding archaeologist/conservator reported that it appeared to be the "...stern post knee and deadwood or the forefoot of a pretty large wooden vessel." He also noted there were "...numerous copper tacks in the lower part of the structure that once held copper sheathing to the outer hull." 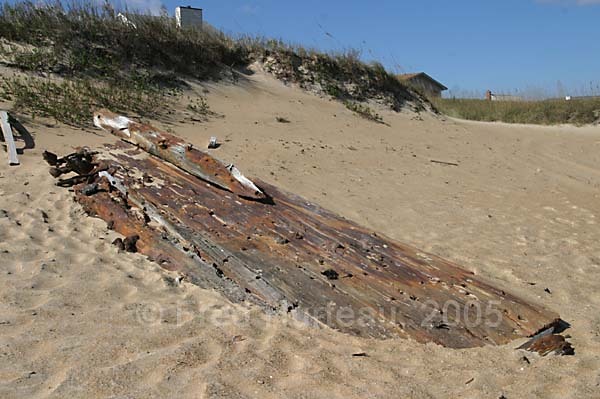 The uppermost left photo shows the relationship of the wreckage to the beach dunes in the background. The other photos provide an excellent look at the details of this interesting find. Location: Between 4/10 - 6/10 miles SW of Ramp #55, located on the beach in the surf zone, and can be covered by water at high time. Apparently it is alternately covered by sand, and uncovered by wave action from time to time. How To Find It: Go to the southern end of Hatteras island past the ferry entrance to the Graveyard of the Atlantic Museum. Take Ramp #55 onto the beach and head SW along the surf. Conflicting coordinates put it somewhere between 4/10 and 6/10 mile from the ramp. 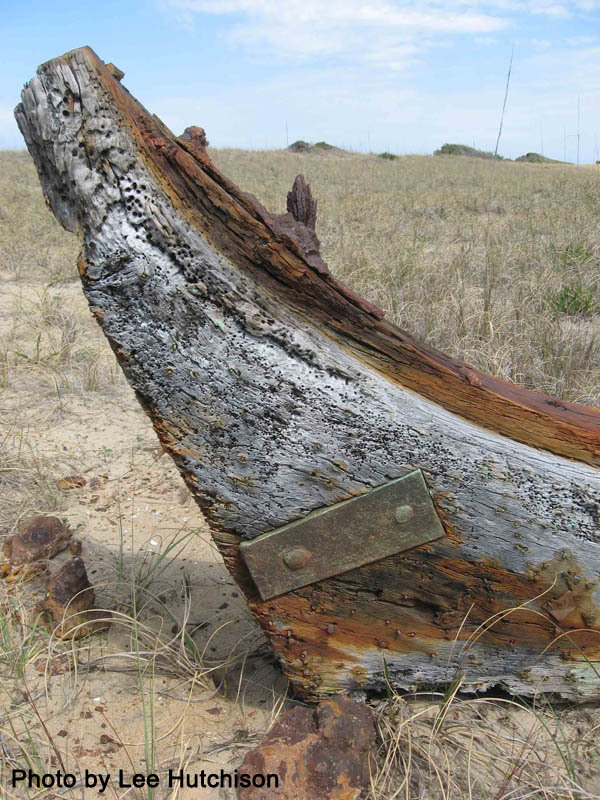 This wreckage has been known for quite some time, having been dubbed the "Ramp 55 Wreck" long ago, though the author had not found this particular wreckage in his many searches. But finally we have a report from Danielle Basso with great photos. 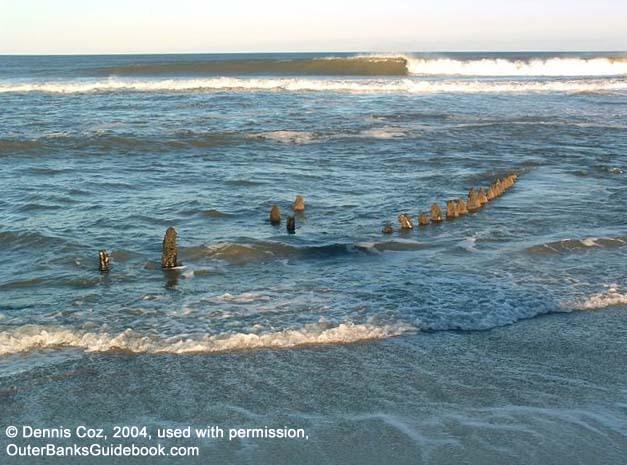 An internet article from Cape Hatteras National Seashore in 2006 stated the park service, along with the Graveyard of the Atlantic Museum, conducted an archaeological study of the Ramp 55 Wreck. 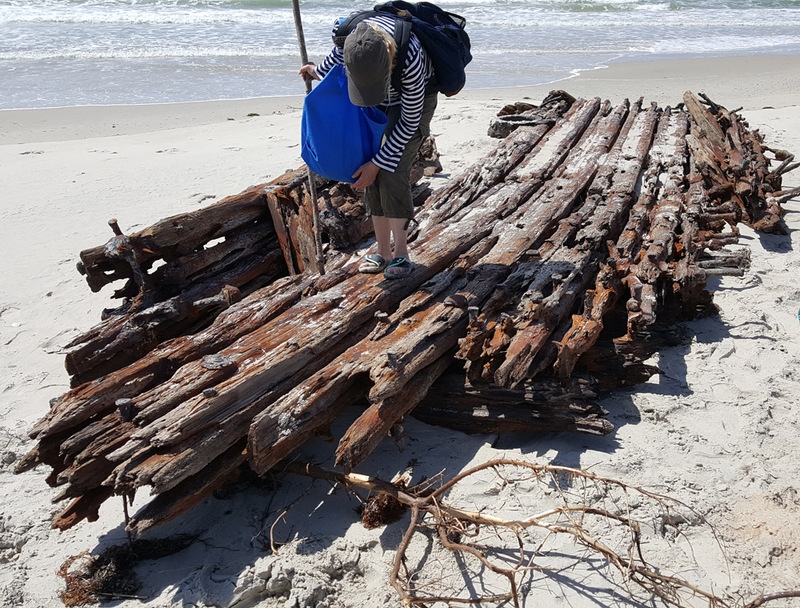 Not much is known of the site except that the wreckage is of a six-masted schooner dating sometime between 1870 and 1900. 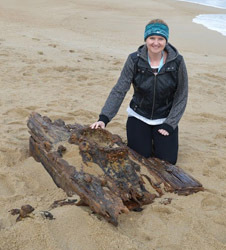 Danielle's report of May 1, 2017 said, "...while beachcombing with my mother ... we came across... wooden wreckage while hiking to the southwestern most point of Hatteras island. This definitely was not exposed when I was there in Sept. of 2016. 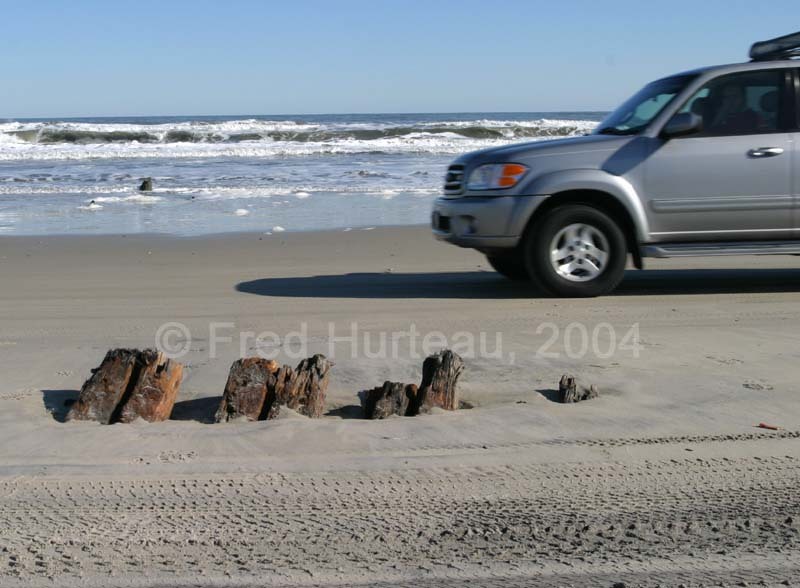 We parked at the lot by the Graveyard of the Atlantic museum and entered the beach via the wooden footpath. We continued southwest along the beach. 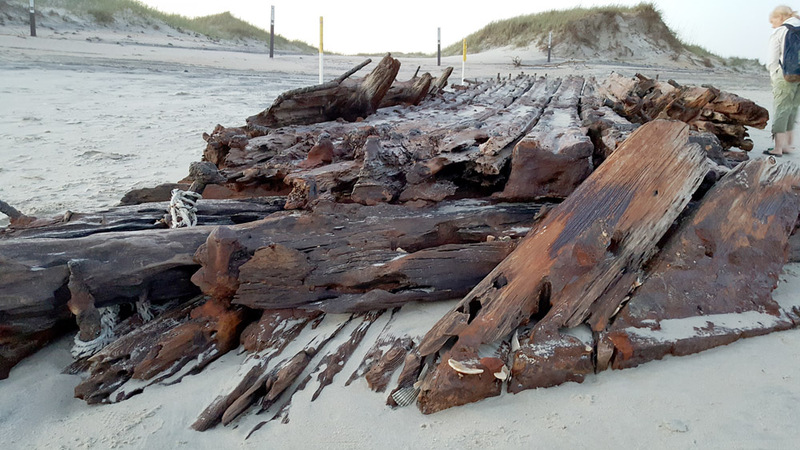 (The wreckage) is very exposed right now but may be covered at high tide." Danielle's photos shown here provide a good look at this wrecakge, and some reference for it's size compared with some beachcombers in view. Historic life-saving stations and heroic rescue stories are next. NOTICE: Follow the ramp access link above for important 4x4 access news. This site displays GPS coordinates in red in the decimal degrees format (hddd.ddddd°). Need to convert to a different format? Click here. You can download my KMZ file and explore all these shipwreck and wreckage sites virtually.